Manchester United supporters were furious with Romelu Lukaku when he came on during Sunday’s 1-0 win over Leicester City. The Belgian, who only has one Premier League start under Ole Gunnar Solskjaer, looked lead-footed and bereft of confidence whenever the ball came near him. Marcus Rashford is by far and away the top dog at the moment but perhaps Man United’s visit to Craven Cottage this Saturday, taking place three days before the mammoth clash with Paris Saint Germain, provides Lukaku with the perfect chance to get some confidence back. Solskjaer will want to ensure Rashford is raring to go against PSG. He will also want to feel like Lukaku, in sharp contrast to Sunday, can have an impact from the bench against the French champions. Lukaku has infuriated supporters in recent weeks. He has encountered something of a slump since the World Cup, which clearly took a lot out of him. 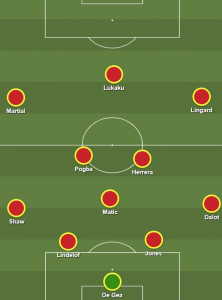 That is why games like the one against Fulham – a team United really should beat or, at the very least, against whom they can create a number of chances – can be so important for Lukaku. The Belgian is not, like some have suggested, low on fitness. He is chronically low on confidence – something only scoring goals can fix.